China, Western Han dynasty, 2nd - 1st century B.C. The two figures with missing hands, clad in long robes, are possibly waiting maids of the Western Han period. 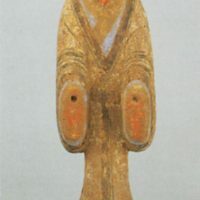 Entirely coated with a white slip, they are painted with eyes and brows in black and a mouth in red. The red color around the collar and the sleeves indicates that a red undergarment is worn, over which a blue robe and a white outermost garment with black rims and decorative motifs are layered. 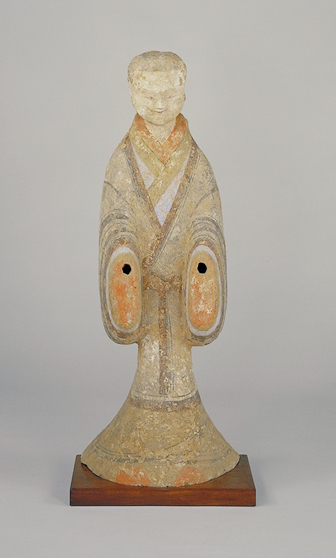 Figurines of this type have been excavated from ancient tombs of the Han Dynasty in Xian, and are believed to have been produced in quantities in northern China in the latter Western Han period. The sculpturing in the front is three-dimensional and is minutely executed whereas the back is executed in rather simply manner.